So on Ravelry I found this adorable toilet paper cover, and normally I don't make this kind of thing, but this one is totally cute. 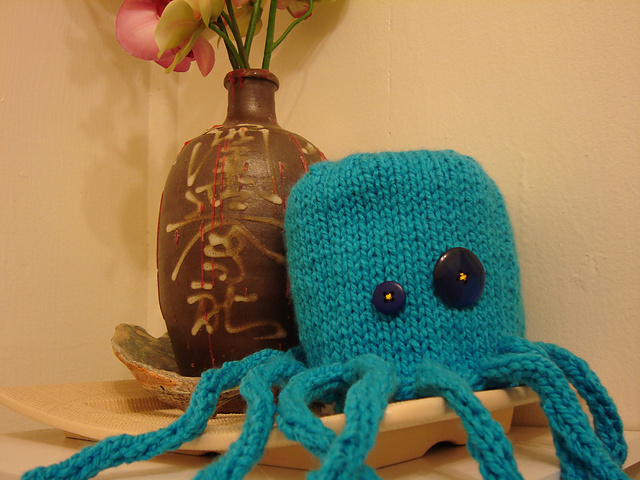 I LOVE octopuses so I had to make one but I'm not the most talented knitter so I made my own crochet version. Ch 2, hdc 10 in second ch from hook. To finish sew on the buttons for eyes. IT SHALL BE MINE!!!! I will make this after I finish the three baby blankets for friends who are due in June. But then. WHAHAHAHAAAAA! Hilarious! Just have to make this one. Thanks a lot for the crochet version. I like these small project rather crocheted than knitted. I love it, and I can't wait to make it, thanks! Making this right now...thank you! I new to the crocheting would and was wondering what "hdc" ment?